AMMAN ------- August 31, 2014------- On its 40th Jubilee year, Bethlehem University has recognized HE Dr. Talal Abu-Ghazaleh by conferring on him an Honorary Doctorate in Humanities for his outstanding achievements and significant contribution to the Palestinian society in particular, and the Arab world in general. 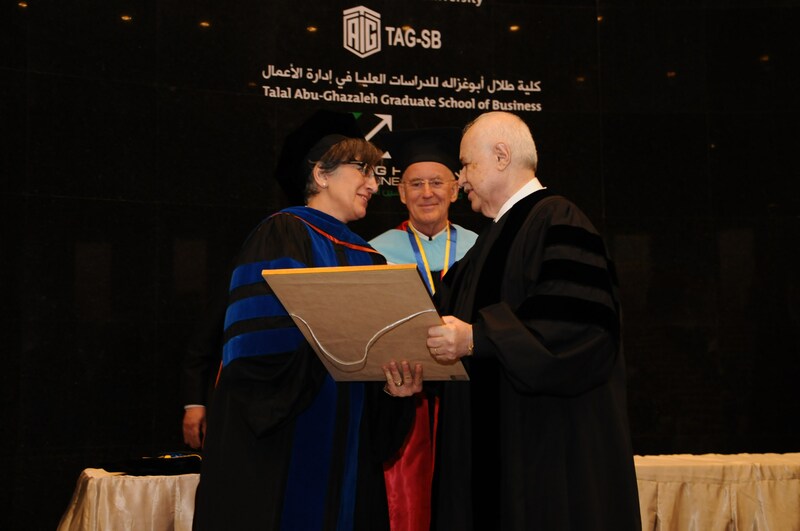 HE Dr. Peter Bray, Vice Chancellor of the University and Dr. Irene Hazou, Vice President for Academic Affairs awarded the Honorary Doctorate to Dr. Abu-Ghazaleh during the 6th graduation ceremony of Talal Abu-Ghazaleh Graduate School of Business (TAGSB). Dr. Bray stated that the Honorary Doctorate was granted to HE Dr. Abu-Ghazaleh in recognition of his efforts to promote the quality of education, democratize it and make it available for everyone everywhere. He also underscored the advanced professional services rendered by Talal Abu-Ghazaleh Organization (TAG-Org) to the public and private institutions and businesses in Palestine and all over the world. 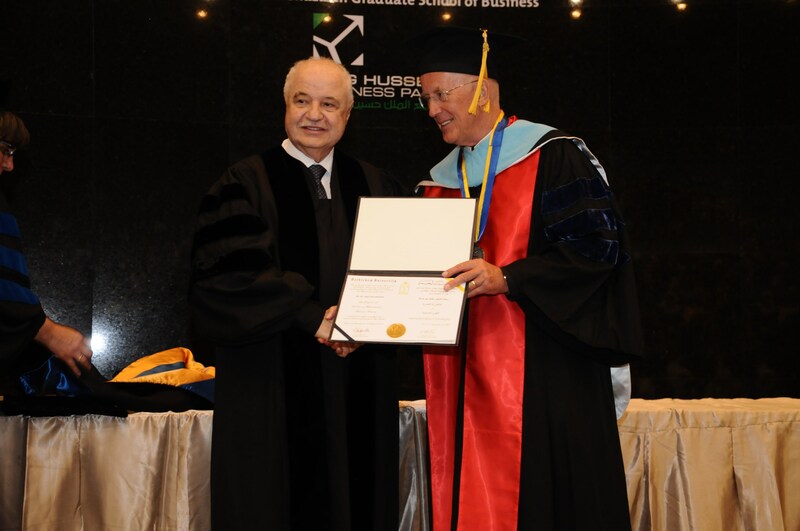 Dr. Hazou, who read the citation for the honorary degree, said that among the several reasons Bethlehem University is recognizing the work of Dr. Abu-Ghazaleh, is his impressive and steadfast efforts to strengthen the institutional capacity of Arab ministries of education, in addition to designing and building educational management systems and boosting teacher training and professional development. Dr. Abu-Ghazaleh delivered a speech in which he thanked the University for such a great honor that touched him deeply, as it is from his beloved homeland of Palestine. He also expressed his gratitude to the University represented by Dr. Peter Bray and Dr. Irene Hazou for recognizing TAG-Org’s commitment to offer excellent services through its 81 offices as well as the quality of education provided by Talal Abu-Ghazaleh Graduate School of Business and all other TAG-Org educational institutions, particularly Talal Abu-Ghazaleh University College of Business in Bahrain.